Businesses are under increasing pressure to enhance staff productivity and maximise results from finite resources. Natasha Egan and Linda Belardi report on how three providers are using technology to achieve efficiencies in different arms of their organisations. Andrew Stanley, Resthaven’s relieving coordinator of housekeeping services, recently won the Aged and Community Services SA & NT Employee Award for his menu management system which records and updates residents’ dietary changes, reducing risk to residents and ensuring the consistency and accuracy of data. The system he developed uses an Excel spreadsheet where all related kitchen, pantry and housekeeping forms are automatically changed simultaneously, once information is entered or updated. 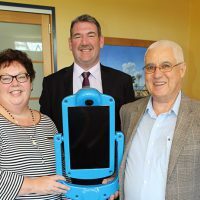 According to Stanley, the low cost project has reduced time inefficiencies, meal and dietary errors and food wastage, and as a result of its success has now been introduced into all of Resthaven’s 10 residential aged care facilities in South Australia. The central database records information on residents’ changing dietary requirements, allergies, food and lifestyle preferences, meal size and can also track the progression of cases of gastroenteritis. This will help kitchen and housekeeping staff to monitor the diet of a resident during the gastro period. Stanley says prior to implementing the menu and pantry form data management system to streamline meal and housekeeping services, staff were spending unnecessary hours individually altering multiple meal order forms when there was a change. “So long as the staff member is typing in the correct information, we have found problems with incorrect meals have been eliminated,” he said. First introduced into the MountGambier site in 2011, the system has been tailored to include additional forms that meet the needs of each site. 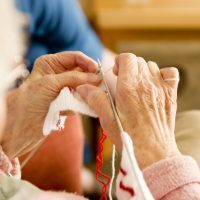 Two residential facilities have also designated responsibility for ongoing management of the system to housekeeping assistants, which supports their learning of additional skills. Stanley has led group and one-on-one training with all housekeeping staff and developed a step-by-step instruction manual to support staff to use the Excel program. In the future, Stanley says he would like the system to be able to read AutumnCare’s dietary requirement forms to eliminate the manual entering of the original data. A 3G-enabled tablet-laptop device gives the on-the-road RDNS workforce access to everything they need, more time for clients with complex needs, and access to automated tasks that save time for staff and clients. “It’s virtually like a mobile office for them because of all that internet connectivity and the suite of applications they have on there,” says Stelvio Vido, executive general manager, projects and business development. “They can effectively communicate with anyone from their laptop. They are all 3G-enabled. It’s a live real-time connection. They are communicating all the time,” he says. A key efficiency from the start of every work day is that staff can log in and start work from home rather than having to drive to an office to get their schedule. Throughout the day workers have access to their roster, the day’s client visits including all client data, plus general computer and internet applications providing clinical information and the organisation’s policies and procedures. Staff can collect and record visit data and email and fax directly from the device. It also has automated ordering of items, such as wound management products, through the provider’s preferred supplier. RDNS has been arming its staff with mobile technology for 12 years and over time it has been able to improve productivity, Vido says. It has achieved this because the solution saves staff and clients time, which enables RDNS to put more time into client care, and can be used as a learning platform for the customer, he says. “Some of the online ordering we can do for the client in their home means it’s very quick, efficient and seamless. It also saves the client from having to do it themselves,” Vido explains. The productivity gains translate to a balance between an increase in the number of clients workers can see in a day and more time with individual clients, especially those with more complex needs who require more time with that worker, Vido says. RDNS is currently exploring the market for a new solution, the sixth in 12 years. The wish list includes route mapping capability to assist workers to transfer between jobs. But the key element of this latest iteration is that RDNS is looking at deploying a variety of devices, including smart phones, as an alternative to a laptop computer or tablet, to meet individual needs, Vido says. As telehealth evolves, Vido says they see use of video increasing in the field, which will drive the types of devices that some staff use. Fewer payroll enquiries, improved productivity through eliminating timesheets, reduced need for agency nurses resulting in wage savings, and consistent and accurate management of multiple workplace agreements, are among efficiencies Bupa Care Services has achieved since implementing a new workforce management solution. Bupa moved from a decentralised industry-based payroll and rostering solution to the Kronos Workforce Scheduler in 2010. The fully-automated centralised system provides real-time visibility of all 60 Australian aged care facilities, which house 4685 residents. Rostering for the 6500 workers is based on staff qualifications and preferences, and standard staff-to-resident ratios. The solution also covers the management and development of Bupa’s 5000 volunteers. Helen Sims, payroll manager at Bupa, says with Kronos’ biometric system Bupa is able to accurately verify employee identities and track their working hours without burdening site managers with the paper-based timesheet approvals, saving 833 hours in total. “We have been able to eliminate the need for timesheets for our 6,500 employees, saving 10 minutes per employee each fortnight. They can now focus on their core duties and ultimately improve quality of care for our residents,” Sims says. Staff ratios are set centrally and implemented locally, based on available resources. The system also promotes work-life balance with staff able to put forward their availability. Managers then use the system tool to assign hours based on preferences. “This really takes the pressure off management and allows them to ensure optimum staff-to-resident levels while providing roster flexibility to best-match employees to the available shifts, especially in cases of absenteeism,” she says. 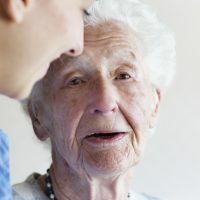 As a result Bupa has been able to ensure in-house carers are rostered as a priority and subsequently the need for agency staff has reduced from 6 per cent of wage cost in 2008 to less than 1 per cent in 2012. Bupa is also applying the workforce scheduling system to its volunteer program, which it says has resulted in a spike in volunteer applications. The technology is also helping managers handle the high number of volunteers. And Bupa now has full visibility of volunteers’ movements, which aids management. Volunteers also benefit through having access to Bupa’s e-learning tool to support their development. From here Bupa is looking at how managers can manage on the go, staff can see rosters and leave balances, and staff and volunteers can make shift requests directly. It is also exploring how it can use the workforce data it has to identify labour trends and cater to resident and employee needs by anticipating demand. This article first appeared in the September-October 2013 edition of AAA.